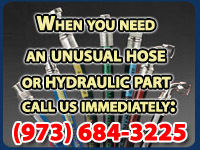 American Hose & Hydraulics provides quality hydraulic services in New Jersey and the East Coast States. We are specialists and innovators providing quality and value in the hydraulic industry. We have made a commitment to provide the most reliable and dependable hydraulic repair service to our customers, while providing reasonable rates. We provide a 6 month warrantee on all hydraulic repairs and hydraulic services. Hydraulic Cylinder shop: Repairs and maintenance of any time cylinders and seal kits. Machine Shop: Parts fabrication for any type of equipment. Hydraulic Welding Shop: Fabrication and welding services for all type of equipment. We have 4 service locations in Paterson NJ, Elizabeth NJ, West Haven CT, and in New York City to serve the east coast with fast, reliable and affordable hydraulic repair and customer service. Our hydraulic repair shops are open Monday to Saturday. We have a known reputation for speedy service and providing quality hydraulic products. We have a complete inventory of hydraulic hose and fittings that are always available to serve the industrial companies in New Jersey and the East Coast States. Our radio dispatched vehicles are equipped with the latest GPS and are in constant communication with our offices to serve you better!. When you need anything hydraulic related, please give us a call now at (973) 684-3225 and our hydraulic sales representative will provide you with all the information and a solution to getting your hydraulic equipment working immediately!